Squash Blossoms, Green Harissa, Créme Fraiche Cheesecake…Yum! Even skipping a week from the Accidental Locavore’s farm box doesn’t mean skipping out of the kitchen. Actually, I’ve been pretty busy putting all this great stuff to good use. 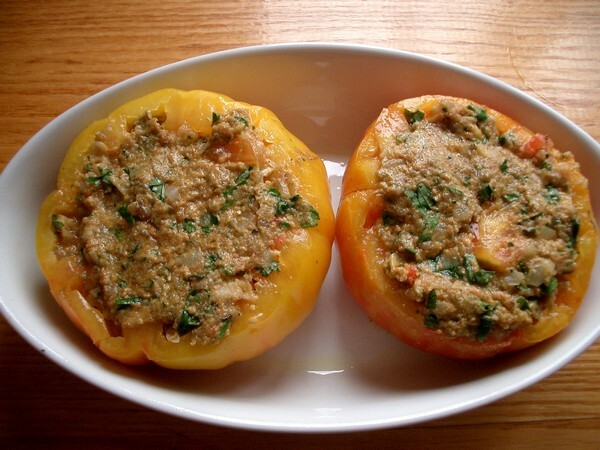 So you can get a lot of the recipes, they’re all on the site and linked below. 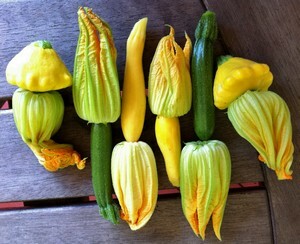 A special treat from the last box were squash blossoms. If you’re not familiar with them, they’re the pretty orange flowers that produce zucchini and squash. Not only are they edible, they taste great! 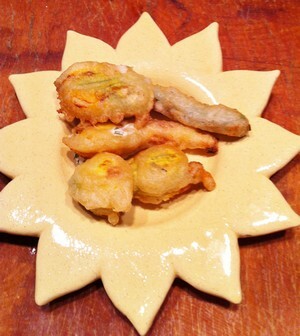 Squash blossoms are very delicate so you need to use them right away. I wanted to stuff mine, since that’s probably my favorite way to eat them. It’s a little fussy but not difficult, you just have to be careful. These were delicious and it was interesting how light the seltzer made the batter. Click here for the recipe. 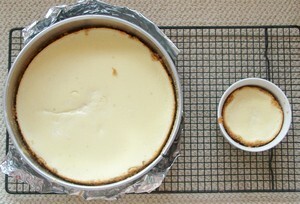 A friend of mine saw a recipe for cheesecake in the NY Times and sent a plea around, looking for someone to make it. Since we were invited to a party in the Poconos the Locavore thought it would be a good excuse to dig out the springform pan and use up the crème fraiche from our recent crème fraiche showdown (results coming soon). The cheesecake was topped with some sour cherries from the Greenmarket which for the first time, I managed to pit without making a serious mess. Because it’s my favorite part of any cheesecake, I added a graham cracker crust. 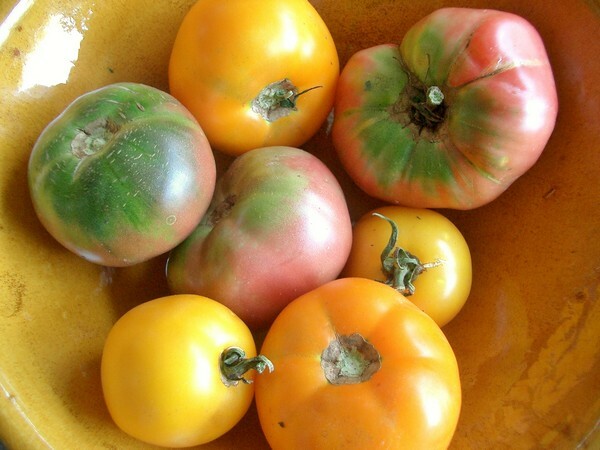 It was delicious, nice and light for the summer. Usually I like my cheesecake plain, but this worked well with the sour cherries (giving you a one-month window of opportunity to make it). Here’s that recipe. I don’t know if you cook like this, but for the Accidental Locavore, one thing, whether it’s food, or a piece of equipment, usually leads to another. 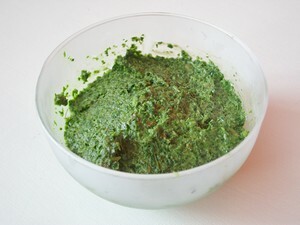 Because I was afraid my Cuisinart had bitten the dust while emulsifying liverwurst, I decided to try a quick green harissa with lovely local spinach and cilantro, to see if my faithful Cusinart from college was still with us. Luckily, all it seemed to need was a rest from all that sausage glop and it breezed through the harissa with ease. Harissa, if you’re not familiar with it, is a condiment from North Africa, usually red and very spicy. It adds a punch to couscous and is an essential part of merguez. 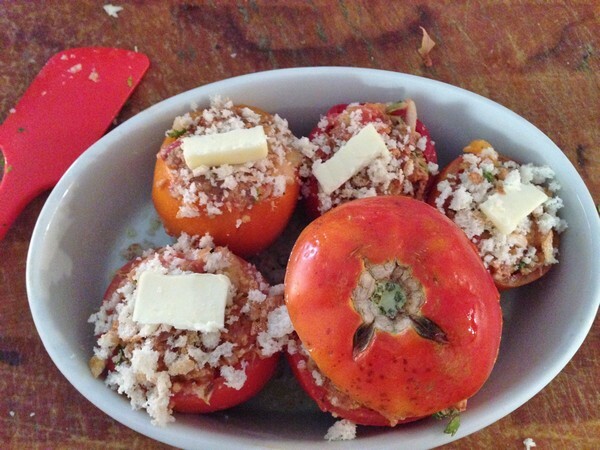 Once the harissa was done, was more merguez far behind? Since all the gear was out to make the liverwurst and cheesecake (and yes, I do realize what a disgusting combination that sounds like), it was easy enough to pull together a batch of merguez. 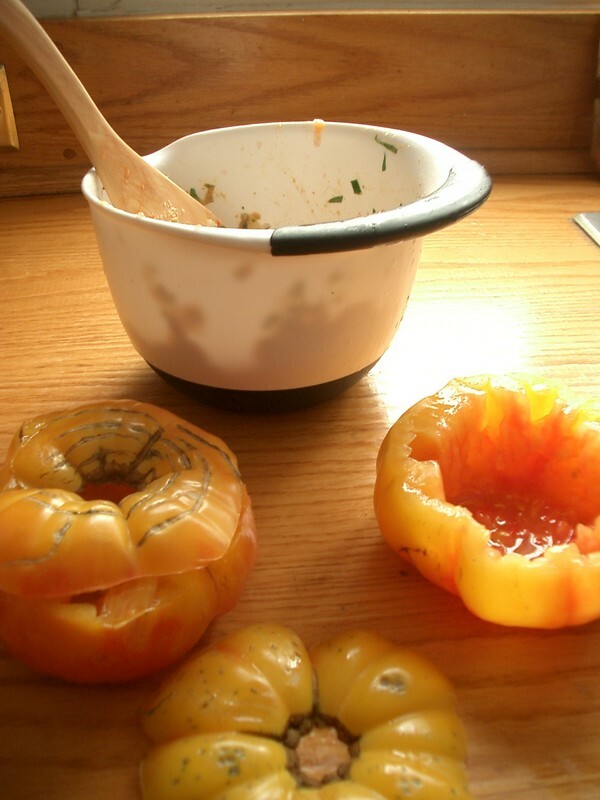 This recipe from Mrs. Wheelbarrow of Charcutepalooza fame, is delicious. I just substituted my green harissa for the traditional red. Delicious, but what’s not to like about lamb sausage with cilantro and spinach?